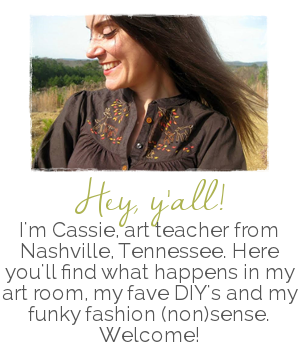 Hey, artsy friends! I'm comin' at you in the midst of clay week(s) at my school...which has me thinkin' all things clay. 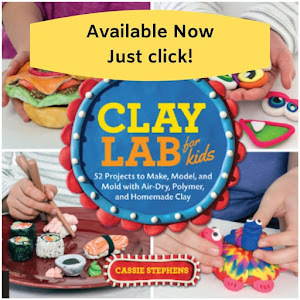 I've shared MANY clay projects on this blog (most with how-to video) and I thought I'd compile them here today. Feel free to use them in your art teacherin' world...just be sure and credit the original source and don't sell my content on TPT (yes, that's happening. I hate a disclaimer but here we are). Anyway, follow the links to the original blog posts for lesson details, videos and more! Before we get to the lessons tho, I thought I'd share my two videos all about clay. 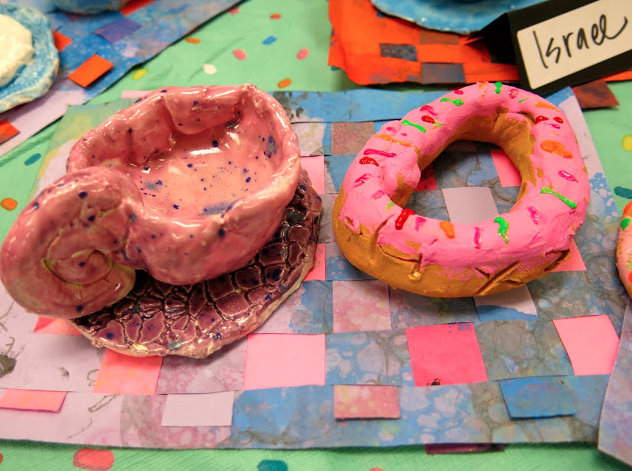 And this one is all about glaze. I hope that they help! Wait, WHAT?! YOU DON'T HAVE A KILN? Well, no problem! 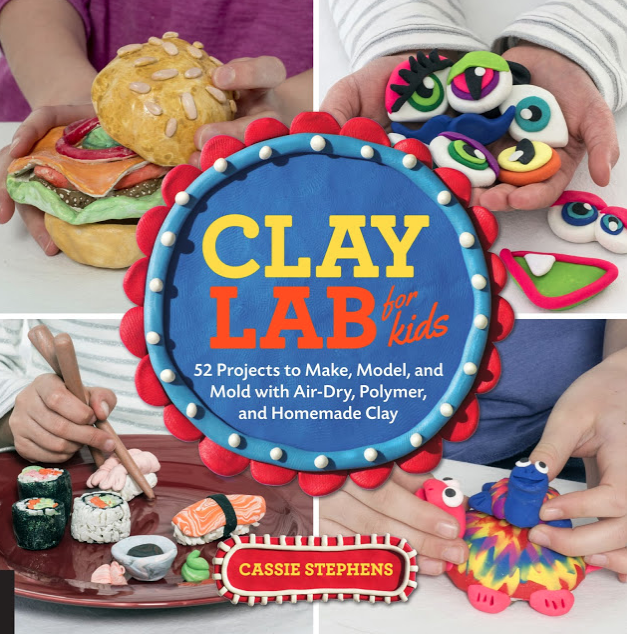 I wrote a whole book filled with 52 clay projects for the kiln-less...although many of the projects in this book could also be done with kiln fire clay. Get you a copy here! Now, on with the lessons! 1. 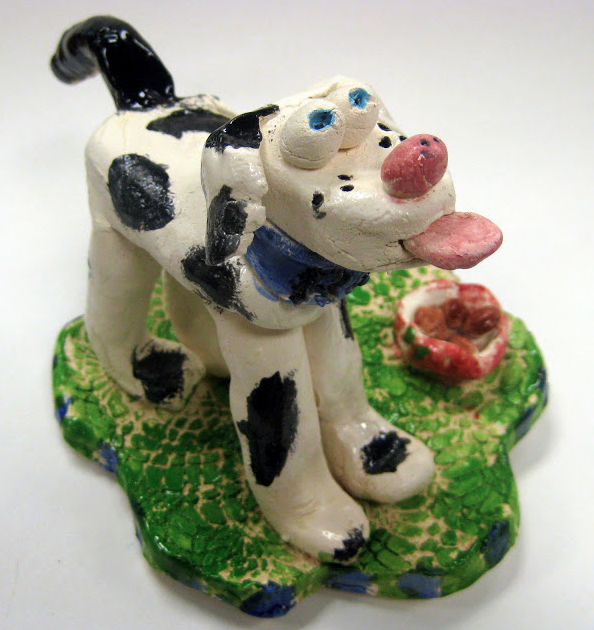 Cats and Dogs Sculptures! 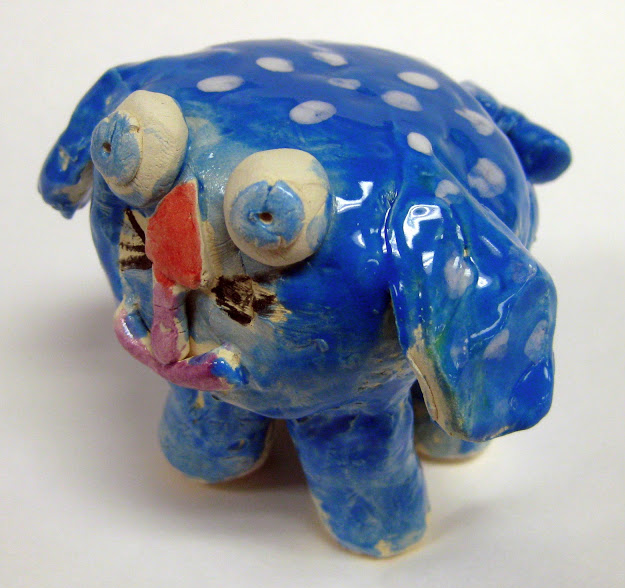 One thing my kids always love to create are animals. I usually do a theme for my art shows and on this particular year, we were raising funds for the local no-kill animal shelter. We created these cute pets. Complete instructions right here. 2. Party Pandas! 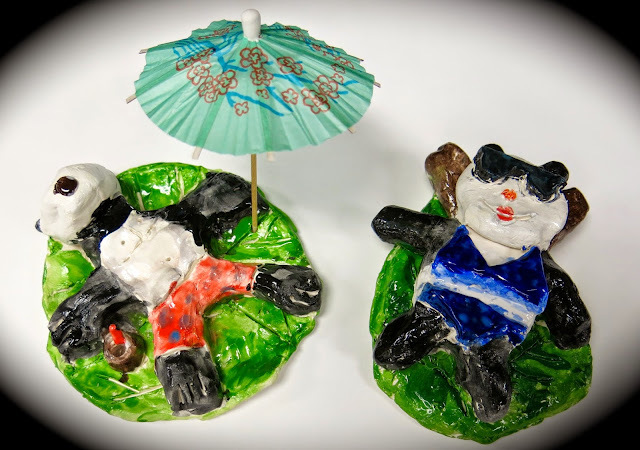 One year, our theme for our art show was Asia and my fourth graders created these little pandas with big personality. I love these sunbathing pandas! More details here. 3. 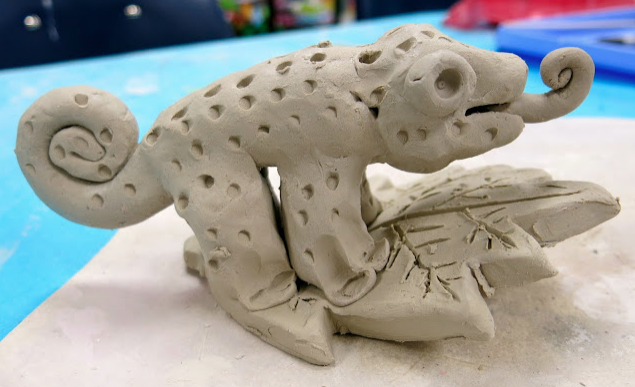 Clay Chameleons! 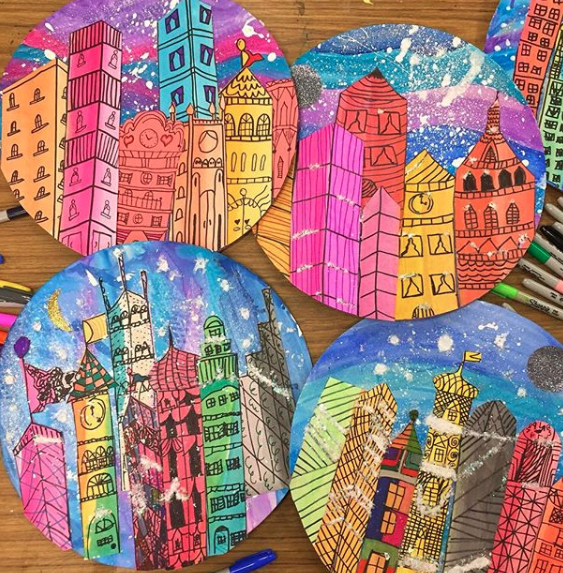 If you are looking for a project that all kids will love and be successful with, check out this one! Our theme was Pet Shop and my third graders rocked this. Try glazing these with the glaze that has specks of glass in it for some real oohs and ahhs! Lesson video here. 4. First Grade Fish! How cute are these? I'm thinking of bringing this lesson back this year to go along with our pirate theme. You can check out the complete lesson with video here! 5. Spring Flowers! 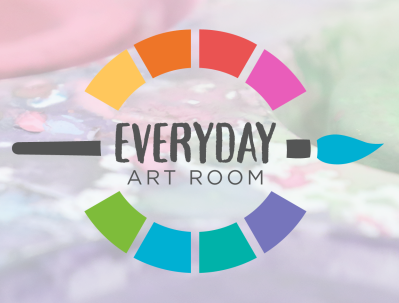 If you are looking for a spring themed project, have I got one for you. 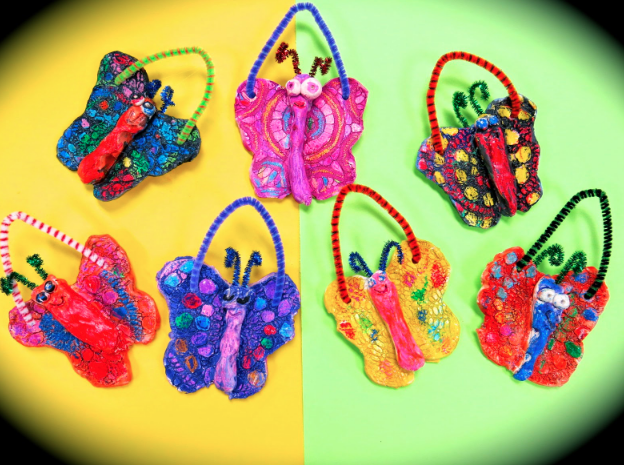 My kids loved this lesson but REALLY enjoyed making the little insects and butterflies on their flowers the most. 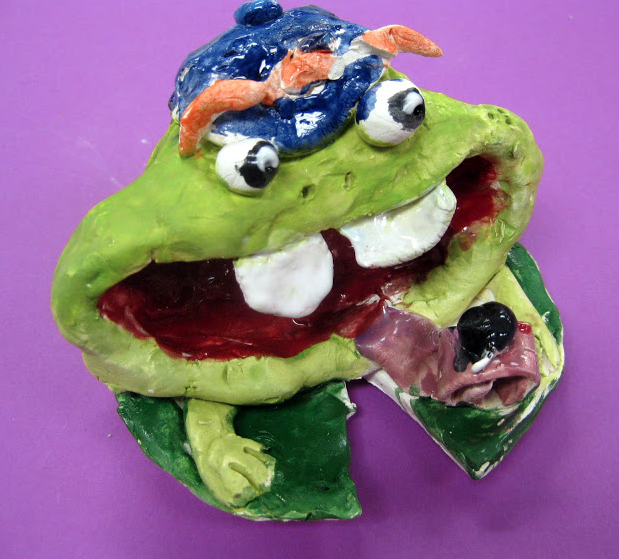 I love when the kids tell a story with their clay. Lesson here. 6. Painted Elephants Inspired by India! 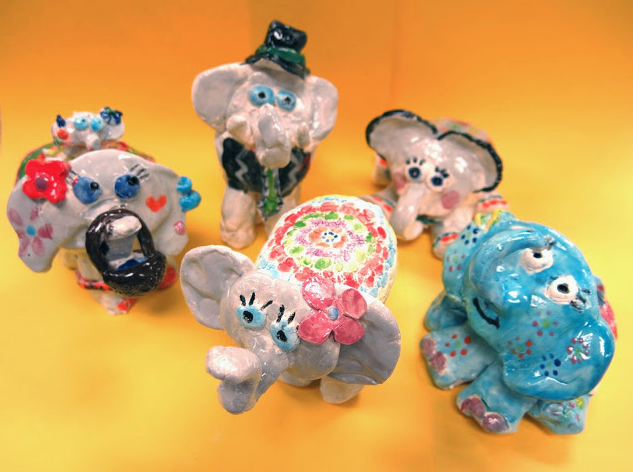 In keeping with our Asian theme a couple years ago, we created these PRECIOUS painted elephants. 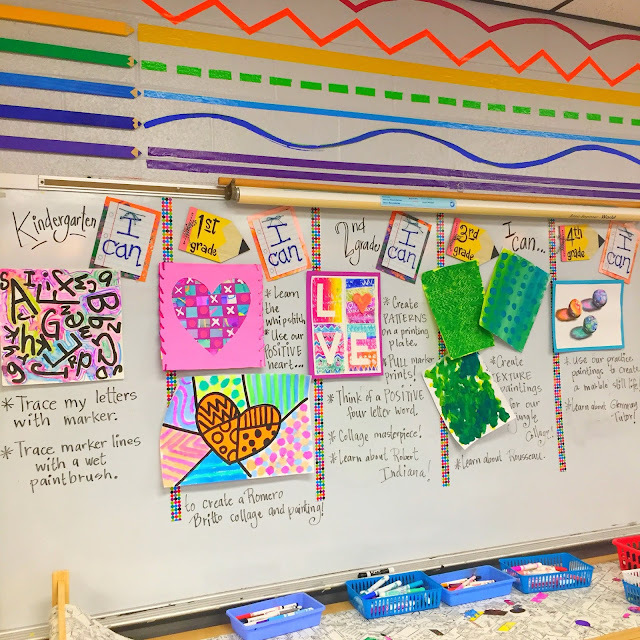 My fourth graders got so creative with this lesson that just seeing these melts my heart! All the details here. 7. Bobble Head Pets! Did I mention that we like to sculpt animals? Cuz we like to sculpt animals. Complete details on these bobble head pets and video right here. 8. Exotic Birds! Remember how I said the elephants were my favorite? Well, these guys place a close second. They did require some assembly for me and my parent volunteers but we didn't mind because LOOK HOW FUN! Lesson and video here. 9. 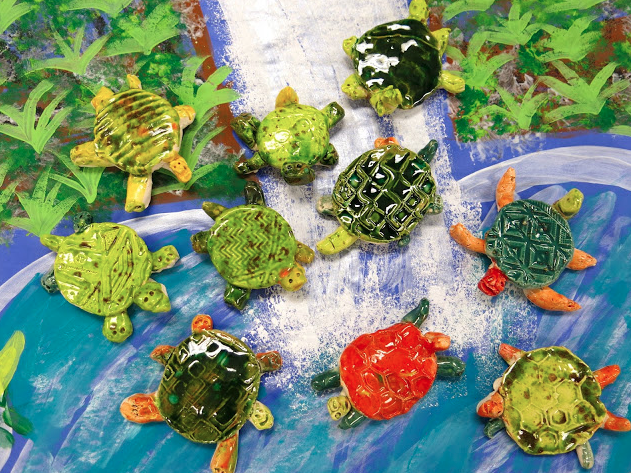 Texture Turtles by Kindergarten! That's right, kindergarten! 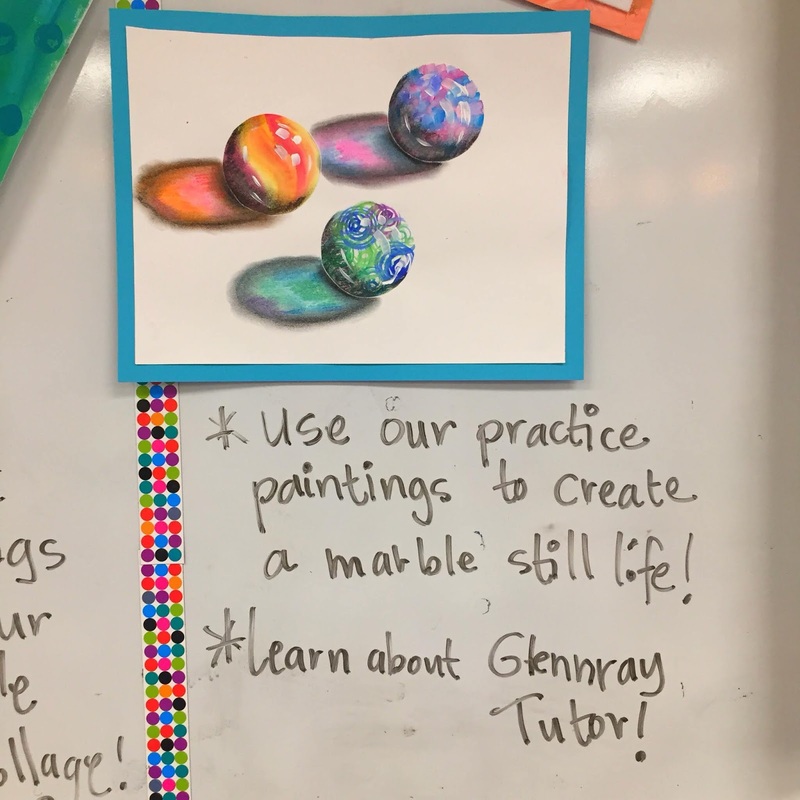 We LOVE this lesson as it involves stepping on our clay and leaving behind our cool shoe tread texture. Lesson and video here. 10. Kindergarten Butterflies! 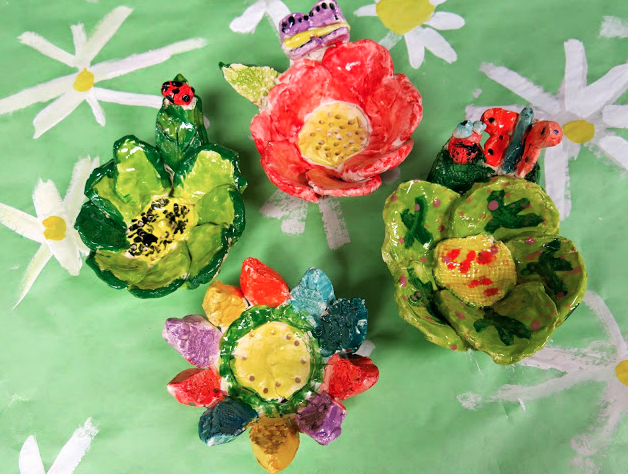 When doing clay with kindergarten, I always have them work with a lot of texture...texture and clay are a match made in heaven! Also, note how we "glazed" these...there are so many alternatives to glazing. So if you can't use glaze, check out how these were finished off! 11. First Grade Fish! Yes, more fish! These were also painted in same manner as the butterflies. Colored with oil pastel and dip-dyed into black ink. If you've not tried this technique, you really outta! 12. Gnome Homes! Did I mention that I like to use texture with clay? Cuz I like to use texture with clay! 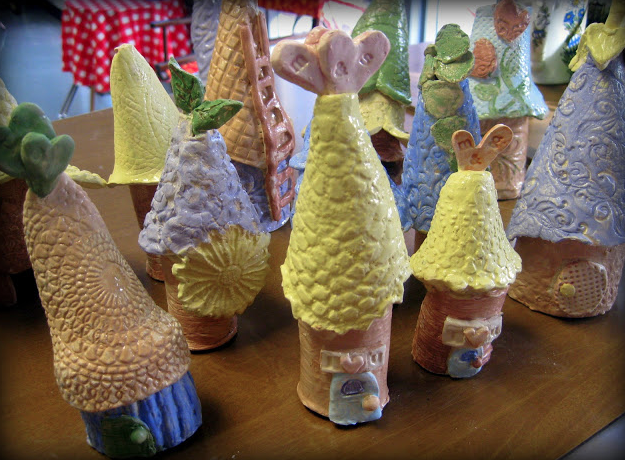 These gnome homes are always a hit with my students AND when I host craft nights for friends! Details here. 13. Chinese Dragons! Remember that Asian theme I mentioned? Well, this was the third grader's contribution to that. They loved making these dragons. Super fun and simple lesson here! 14. Initials Plaques! 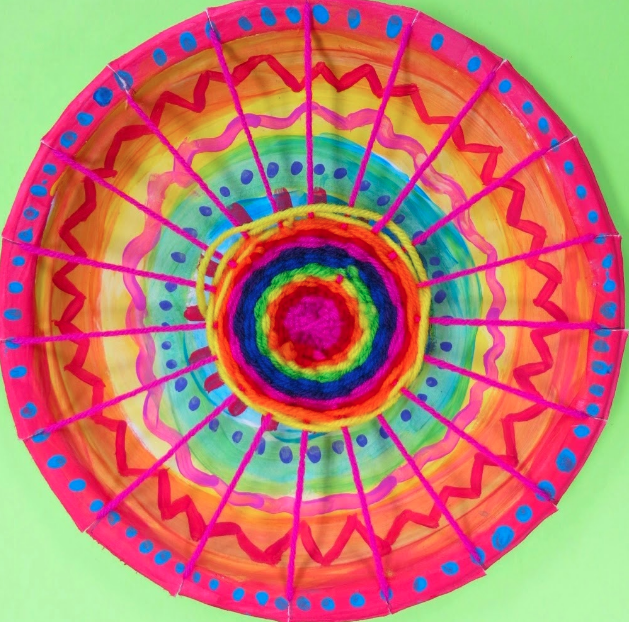 This is one of those projects that I often return to because it is always a hit with the kids. 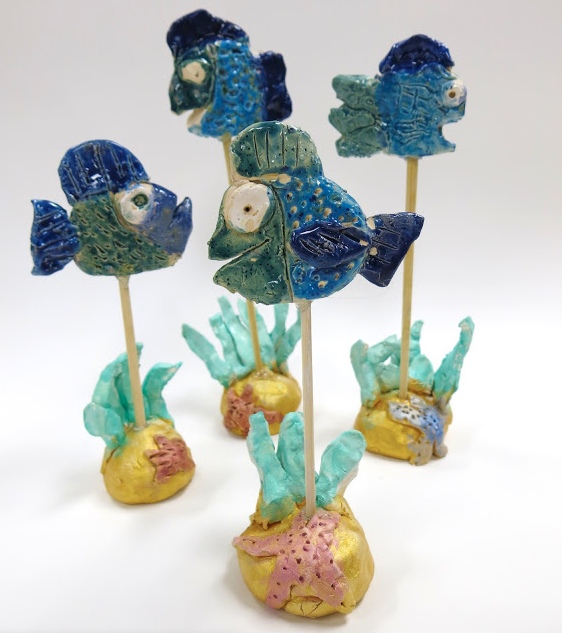 This is also a great lesson if you are short on time and clay. Details can be found here. 15. 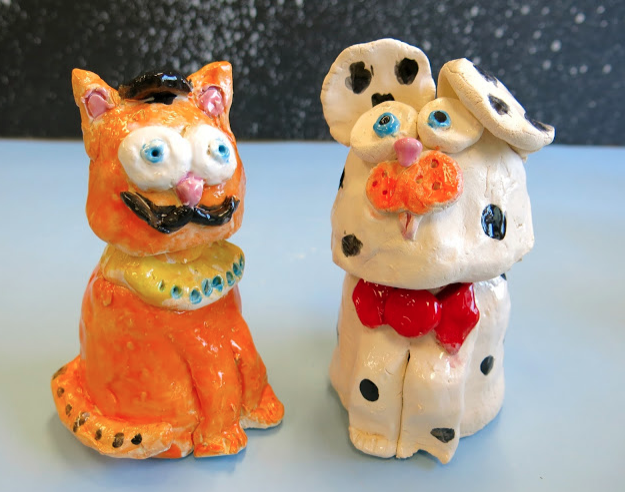 Pinch Pot Friends! 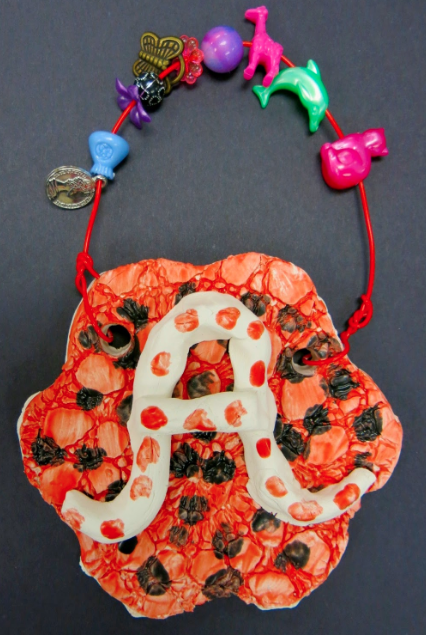 All our kiddos need to know how to make a pinch pot...so much can be created from this simple vessel. 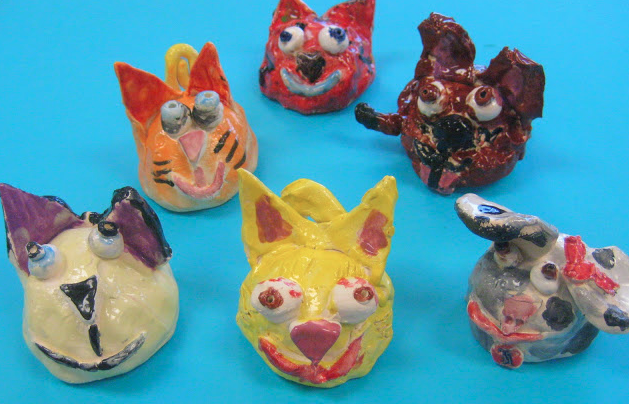 Like these sweet pinch pot friends. Check out the blog post for details. 16. 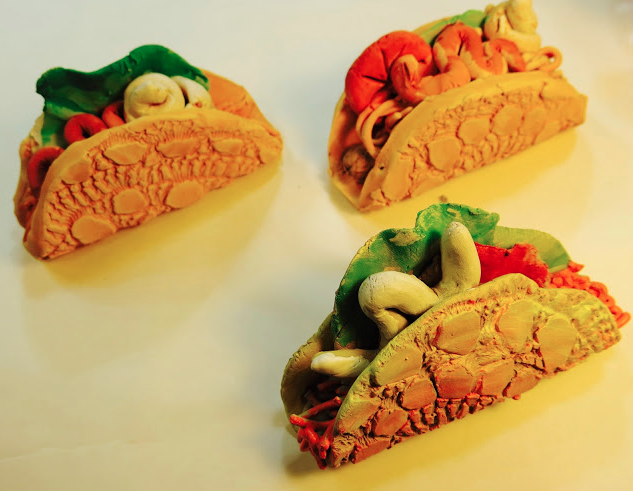 Texture Tacos! Y'all, this is a lesson I did with my kindergarten and they ROCKED IT! Not to mention, they had a blast. All the details along with a video can be found here. 17. 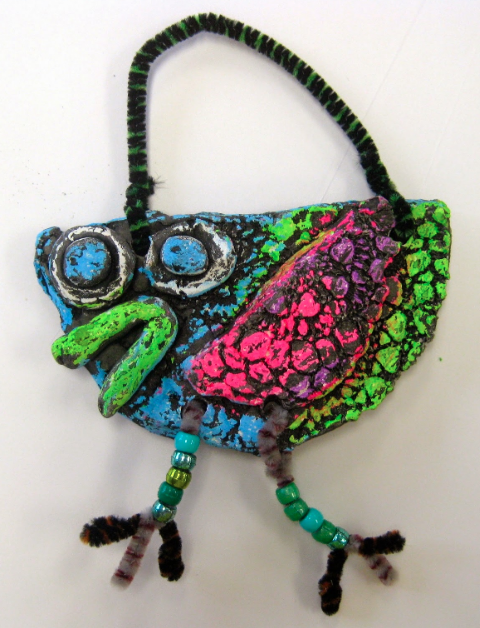 Kindergarten Birds! That's right, kindergarten! 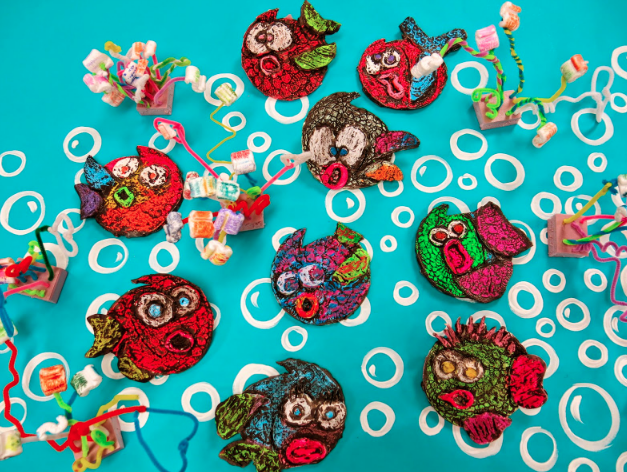 We loved creating these and each one was as wild and wacky as the next. All the details here! 18. Pinch Post Pets! 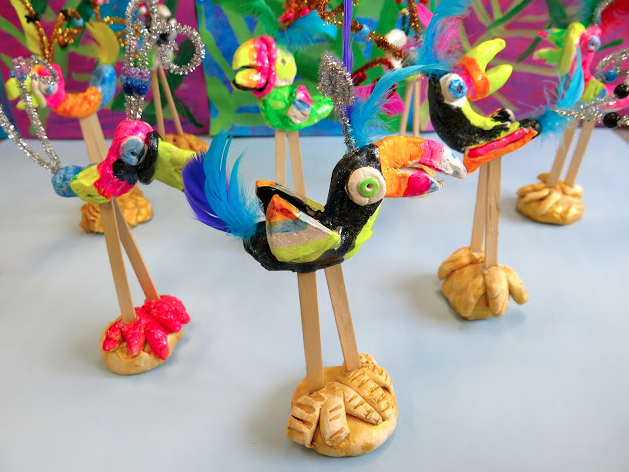 First grade made these cuties one year and I cannot get over them. Look at that attention to glazing detail! Lesson here. 19. Coffee and Donuts! 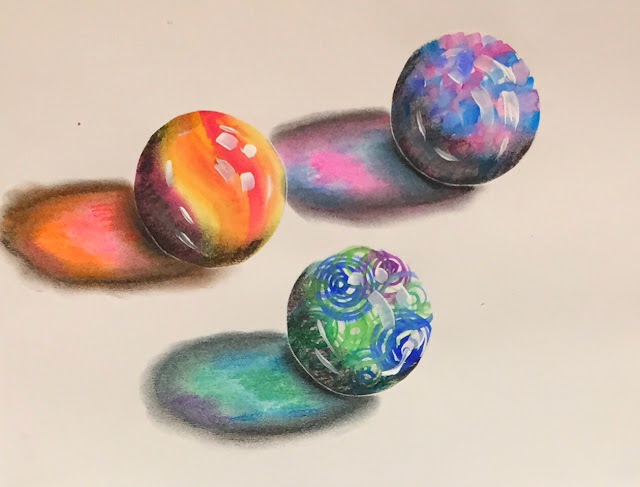 Okay, so this blog post actually DOES NOT have each project in detail because at the time it was written, I was working on my clay book! So the projects you see here can be found in my book. 20. 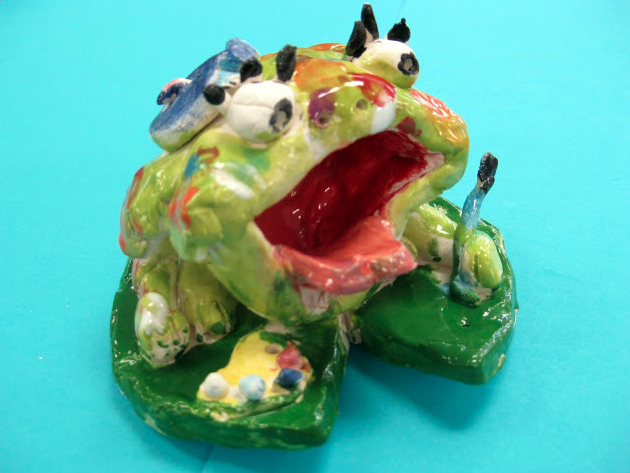 Fabulous Frogs! And, last but not least, these here fabulous frogs. This was also apart of our spring theme...and I just love the personalities of each. All the details here. 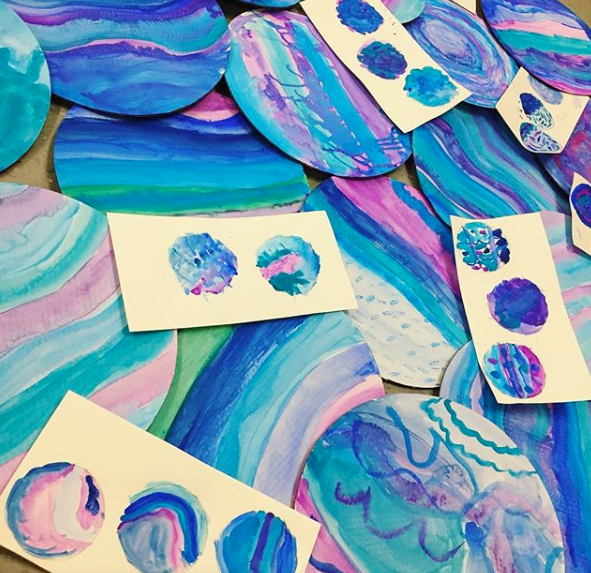 I cannot wait to share with you what my kids are creating for our pirate themed art show...but if you want to stay in the know, you should totally follow me here! 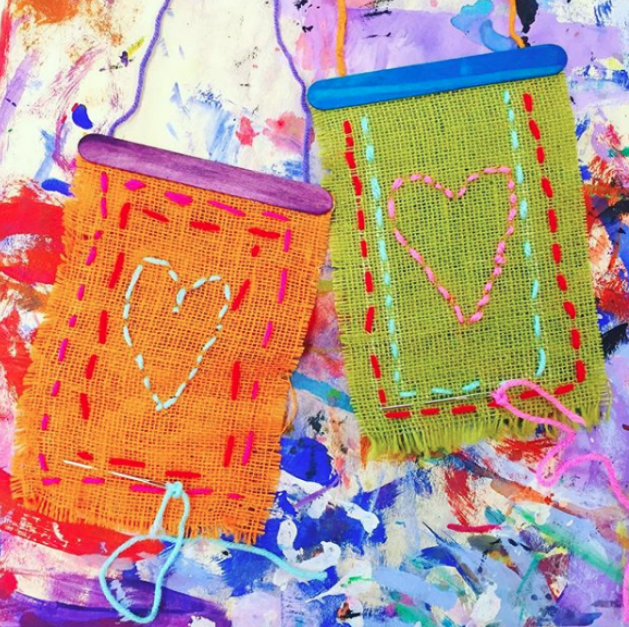 In the Art Room: My Favorite Fiber Arts Lessons! You can preorder yourself a copy here if you are interested! But if you just can't wait, I thought I'd share some of my very favorite fibers projects right here today. Be sure and follow the links to the lessons as nearly all of them have how-to videos that are perfect for you and your students. Let's start with sewing! 1. 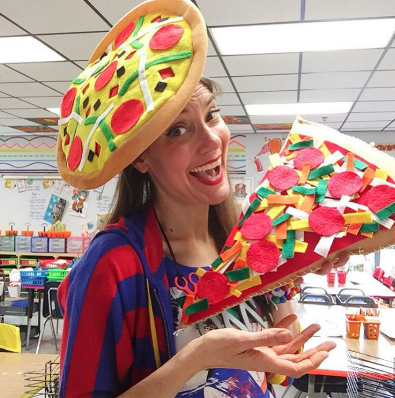 These GIANT pizza pillows were such a hit last year with my students that I knew I had to do it again. Because I was wrapping my fibers book this past fall, I decided to kick off the school year with fibers. Usually, I'm all about fiber projects in the spring. 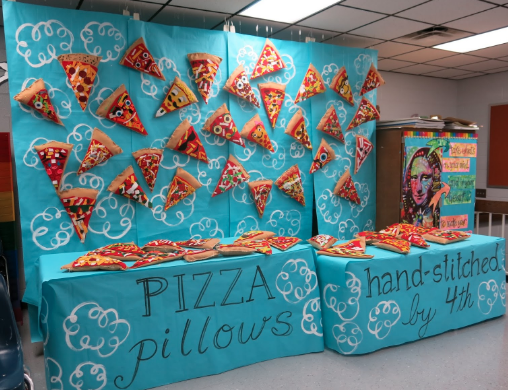 This is how we displayed the pillows at last year's art show! This year, we also made both emoji and donut pillows (size: HUGE) but for details on those, you'll have to scoop up my book. 2. 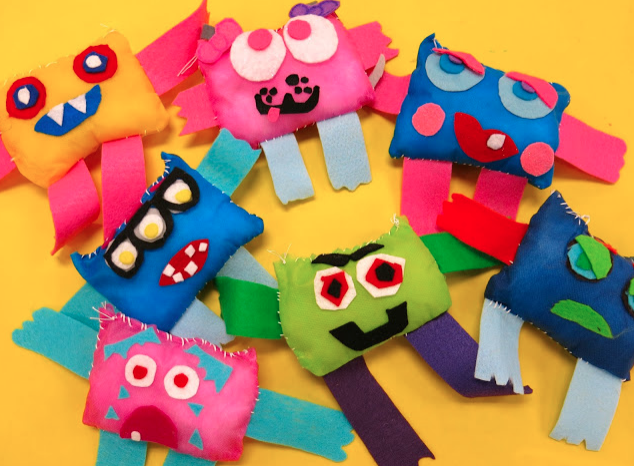 If you are looking for a beginner sewing project on a smaller scale, you might wanna try these stitched monsters on for size. My kids used Smart Fab fabric for the bodies but felt would work just fine. If you are curious what types of needles and thread I recommend, be sure and check out this blog post as well as the others where I break it down for you. 3. I learned embroidery from my grandma when I was in elementary school and I LOVED it. It felt so good to learn something so "adult" in my mind: creating a picture with needle and thread. I love sharing this experience with my students now too. 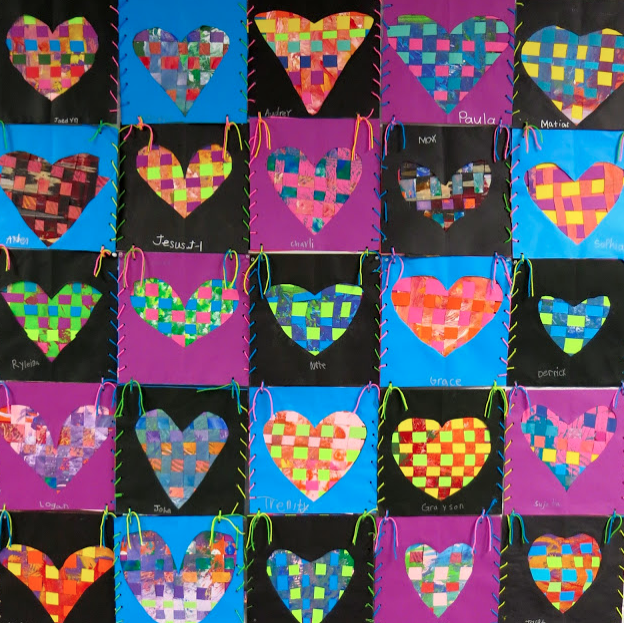 You can read all about this Our School Has Heart fiber art's experience right here. Actually, the above video was created for AOE during one of their online conferences! 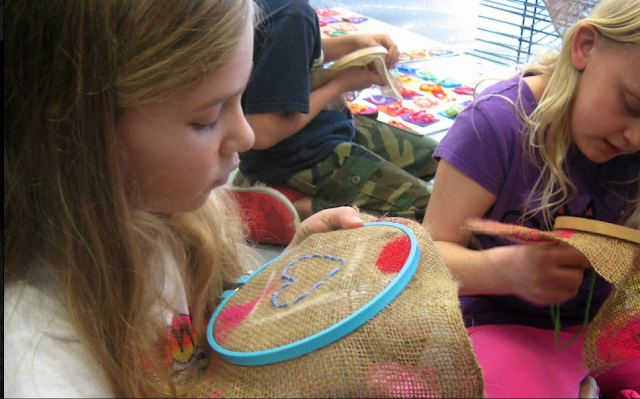 This is a couple years old but does walk you thru a lot of important details of all things fiber arts and kids. 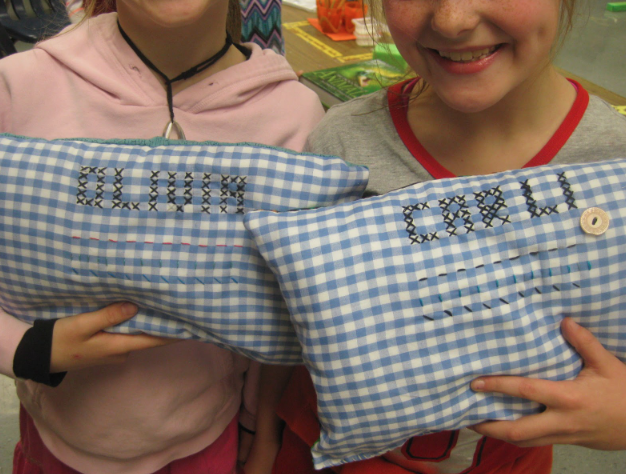 And here is my troubleshooting embroidery with kiddos video. I hope you find them helpful! 4. 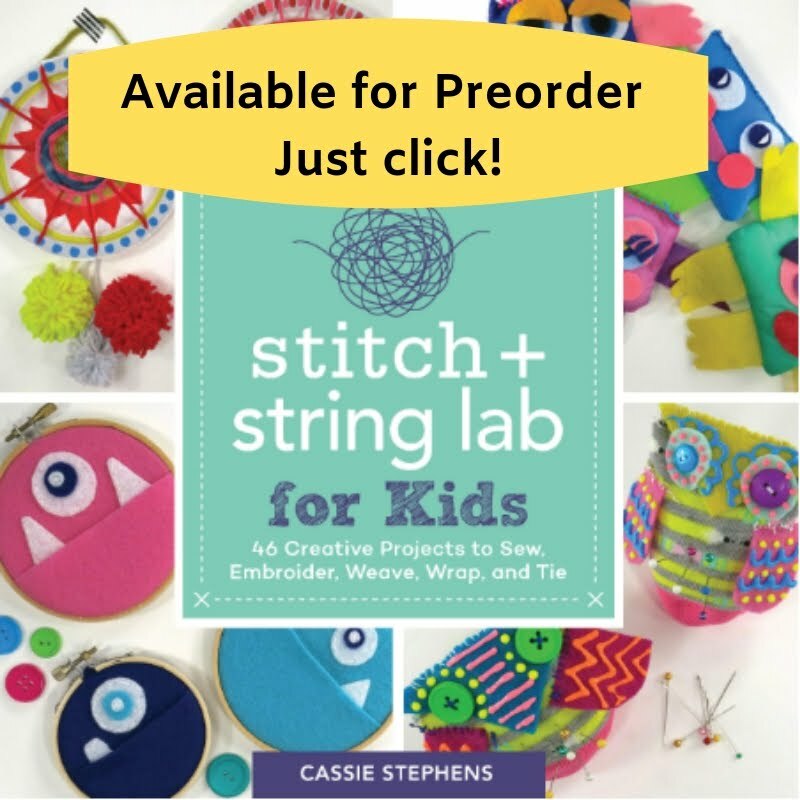 For even MORE details on sewing and embroidery, along with a book I strongly recommend, visit here! 5. Needle felting with kiddos is not something I do very often...but I do enjoy doing it! If you attempt needle felting with children, I'd make certain it's with a group of kids that understand the dangers of the needle felting tool and are responsible enough to handle it. As y'all know, I LOVE needle felting and have put in countless hours stabbing stuff. 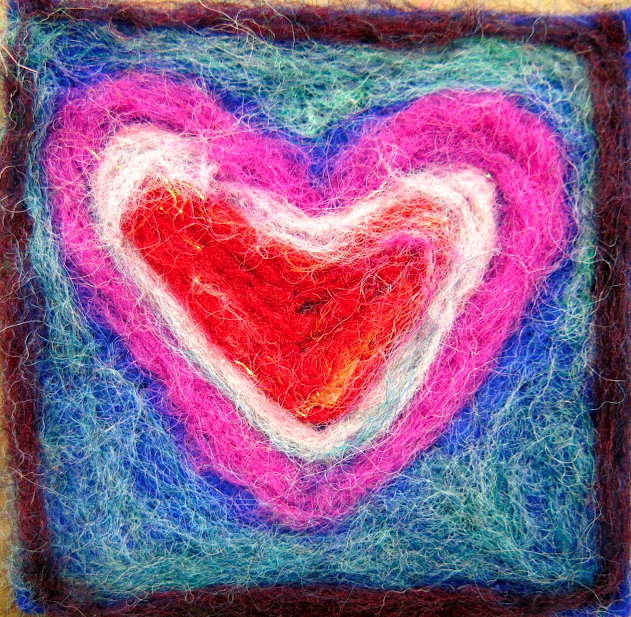 If you are interested in learning more about needle felting, start here. 6. 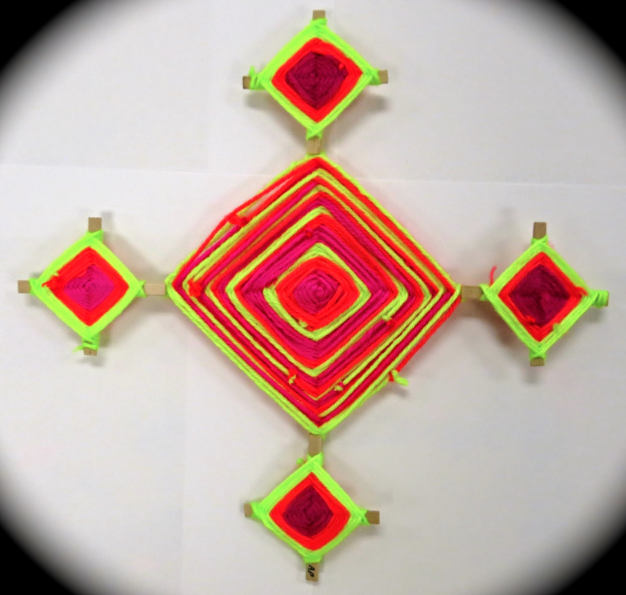 One of the most popular lessons on this blog has been my string art lesson. This is based on a project I did in 5th grade and LOVED. My students have loved it just as much. I've created videos to walk you and your kids through this lesson so be sure and check out this blog post AND this blog post! 7. 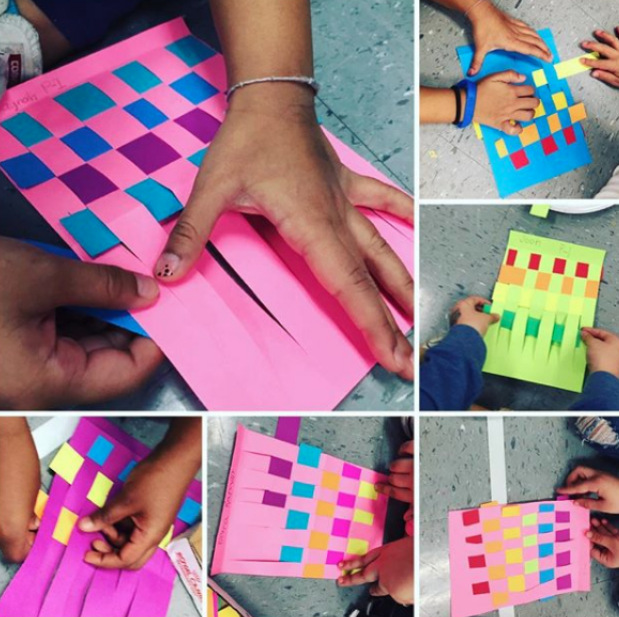 Paper weaving is a must when you introduce weaving to your students. But what to do with the paper weaving when finished? 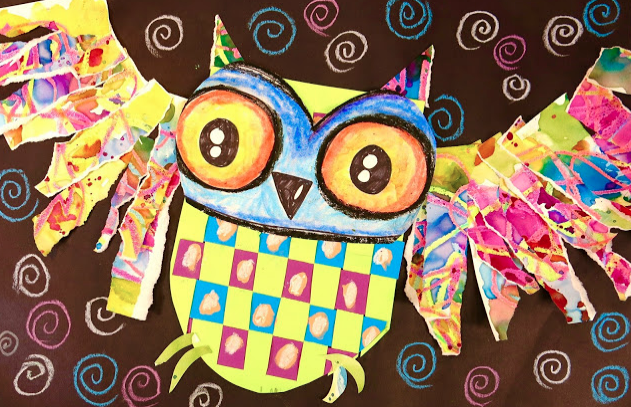 Last year, we made these woven owls and the kids loved them! Both this blog post and the one mentioned above have A TON of videos on teaching first graders (and up!) how to make a paper loom and weave. 8. Circle Loom Weaving has always been a huge hit! I normally do with my second graders in the spring but this year, I did it with third grade in the fall. I can't tell you how many videos I have on this! Be sure and check this blog post out if you have any questions about getting started. 9. 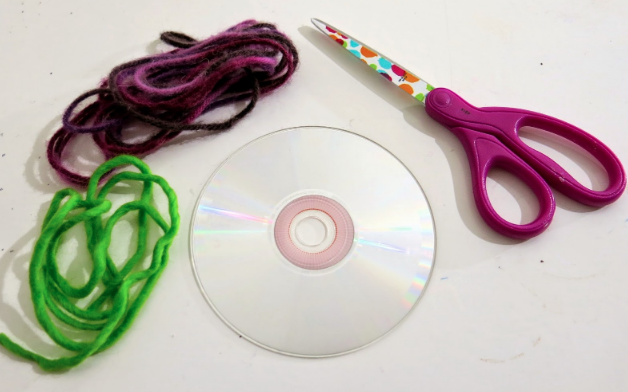 Have you ever tried CD or Embroidery Hoop weaving? So fun and easy! 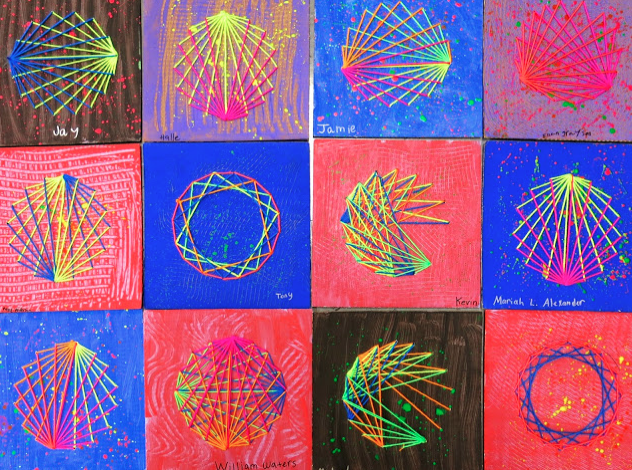 Last year, my second graders tackled CD weaving instead of plate weaving. It was a great way to upcycle those stacks of CD's I'd been accumulating. This type of weaving takes less time than plate weaving as you don't have to spend two art classes painting the plates. They also look super pretty in the window when light hits the CD. Video and lesson details here! 10. 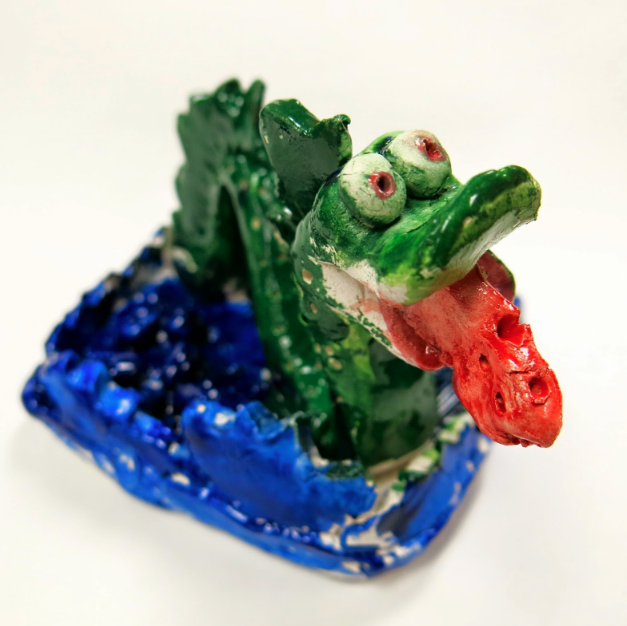 Whenever I get stumped for a lesson, I just think back to the things I enjoyed creating as a kid. I remember the summer I spent at a vacation bible school learning straw weaving. So fun! My kids love this one too. Details and video here! 11. Want a lesson that packs a huge punch? 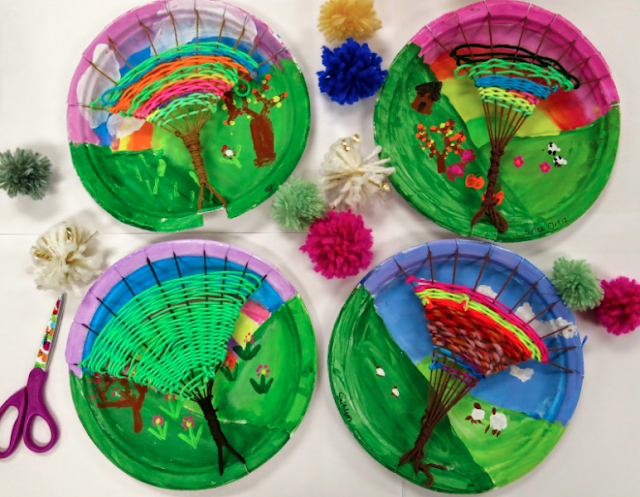 Tree weaving teaches landscape painting, weaving and so much more! This lesson of mine has been another huge hit on my blog. I have many videos to walk you and your kids through this fun technique. You can find it here. 12. I have yet to meet a kid who didn't love making Ojos de Dios. Why not try expanding on that love by making BIG God's eyes?! We did that here! 13. 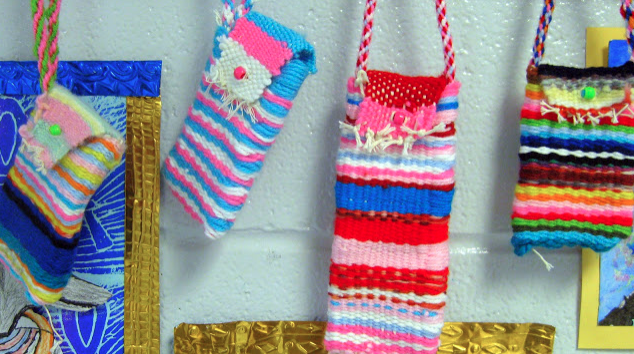 Pouch Weaving used to be one of my all time favorite things to teach. 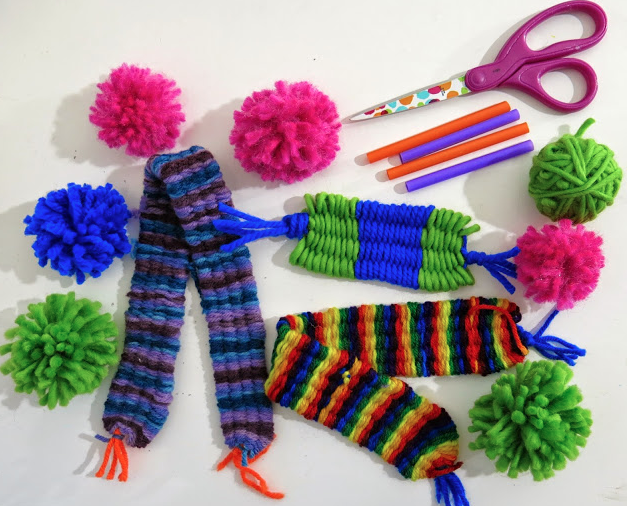 Because it is complex, I created an entire series of weaving videos for you and your students, including how to create that cool cord. You can find the beginning of the series here. 14. Got yarn? 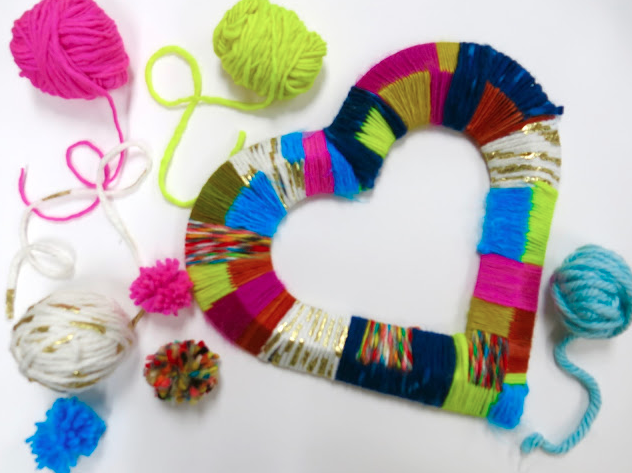 Then you and your kiddos can yarn bomb! What a great activity for your early finishers too. 15. Shibori! 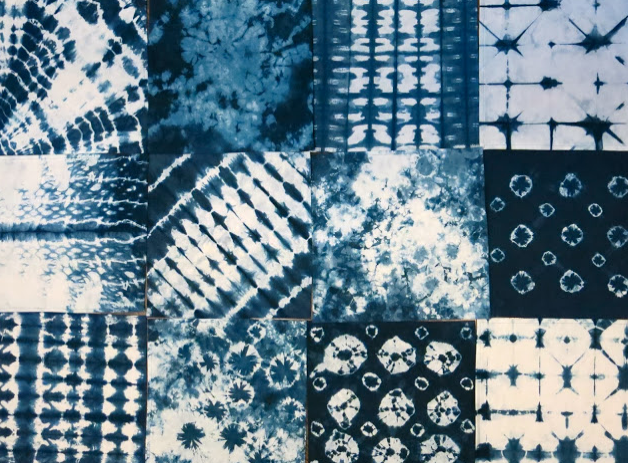 I love shibori dying and so do my students. I created a video that explains EVERY one of these folding techniques and you can see it here. So, truth be told: I've been blogging for seven years and teaching for twenty. I KNOW I've left some great lesson links and videos off this list accidentally. So, you are wanting more, give my name and whatever type of fiber project you are interested in a google search...or search in the bar on the side of this blog. 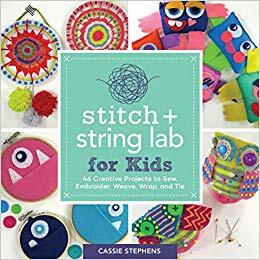 Because there are just so many fun fibers lessons out there. AND stay tuned for my book where there are even more!